In recent years, and prior to my Orthodox catechesis, I heard many a Protestant writer or preacher lament that Easter was not of enormous import to most Christians when it was the eminent Christian holiday. I didn’t share that view. Easter was an after-thought for me – another spring holiday without much real significance. Little did I know that it was the cultural liturgy of the market-place that informed my position towards the holiest of Christian celebrations. Liturgies form us. Whether they are cultural or religious, we are moved to be formed in the image of something and in the West, the market-place is driven by the most powerful liturgy called Consumerism. Christmas is the most powerful holiday in our culture and not because of what it is or what it means; it is the most powerful because of the 30-something day cultural liturgy from Black Friday til Christmas day that forms our hearts not toward God, but towards pretty much everything else. As James K.A. Smith notes in his book Desiring the Kingdom, the Culture understands liturgical formation better than the modern church does. 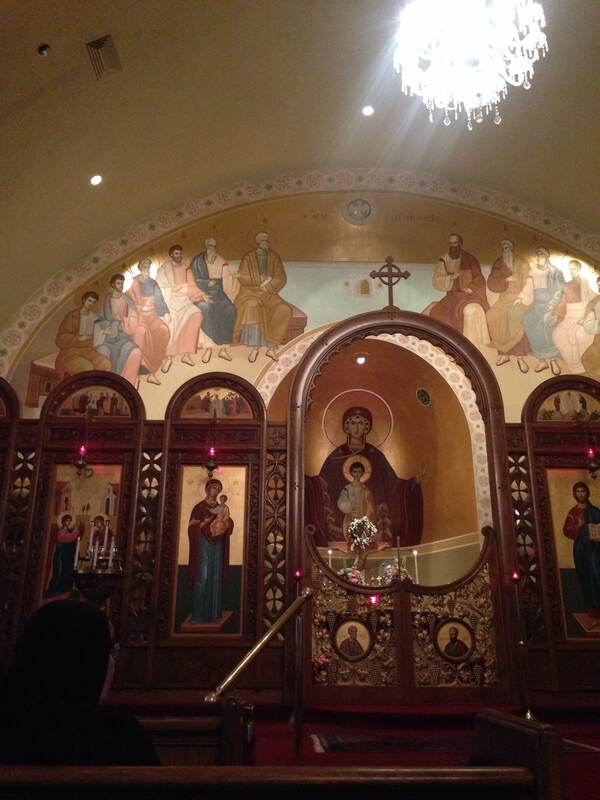 The Holy Orthodox Church is not the modern church. Before I decided that Orthodoxy was the church of the Apostles, the Fathers and Christ himself, I longed for liturgy without knowing what I was longing for. I think this is the basis of the modern Evangelical root of church innovation. The Western Christian wishes to attach himself or herself to something, but doesn’t know how or have the framework for doing so; so innovation in church methods based on market research emerge. A few years ago, I’d fast all of Good Friday (and accidentally get drunk when breaking fast that night with beer and bread; Lord have mercy!) or round up friends for a Maundy Thursday dinner or try to watch the Passion movie. These were my own personal longings for connectedness to Holy Week and the larger Church; these were longings for liturgy. Little did I know that there was already a place where these connections existed and they existed nearly unchanged for most of 2000 years. As the American Christmas machine has its Genesis on Black Friday (or, sadly, Thanksgiving Day), as it sweeps us up into its greats consumer machine for its High and Holy Christmas Day, so the Orthodox Church prepares its people for the most important holiday of the year for the nine weeks proceeding Easter (Pascha for the Orthodox). The Holy Season begins with Triodion – 3 weeks before Great Lent: it is the preparation for the preparation. Then the 40 day Lenten fast kicks off with Forgiveness Vespers, where the Priest(s) of the church comes to the parishioners to ask for forgiveness (could you ever see an Evangelical mega-celebrity preacher doing this? ), the parishioners do the same of him and of each other – a line is formed up the center aisle of the church and every single Christian there asks the other for forgiveness whether they know each other or not. It sets the tone of this great season of repentance. Lent is difficult. It is the liturgy that prepares us for Pascha and it is the liturgical force that shapes our hearts toward to love of God and his Holy Resurrection. Lenten practices vary from parishioner to parishioner under the guidance of a Father confessor who counsels the penitent into penance. Traditional Lenten fasts include removing meat, dairy, oil, fish and most alcohol from one’s diet (and all food and water for the first three days of the fast) – for those weaker brothers and sisters (myself included!) weekend reprieves from the fast are permitted. Lent is most difficult and it is most rewarding. It permits one to see his passions for the controlling forces that they are and it plants the seed of the greatest joy in one’s heart for the hope of the resurrection. (As an aside, there is a similar fast leading up to Christmas for the Orthodox that many Westerners would do well to adopt to help counteract the forces of unbridled consumerism that the Western church has almost fully embraced.). When I became frustrated with Evangelicalism, it was because I was no longer able to attain some sort of ecstatic experience that I conflated with worship. The rock music and light shows didn’t give me that dopamine hit that they used to. My “heart” wasn’t moved if the sermon wasn’t “hard hitting” enough or “charismatic” enough. David Crowder didn’t send me into the Third Heaven of emotional experiences anymore. Ecstatic experience is not Christian worship, despite Christian culture (which openly borrows, adapts to and confiscates from the larger “Secular” culture) telling most Evangelicals this for decades now. Liturgy and worship literally mean “work”. Conformity to Christ cannot be attained by ecstatic experiences (though, on extremely rare occasions, ecstasy may be present); conformity to Christ comes through liturgical work, which includes his Sacraments (or Mysteries). The Holy Orthodox church (a natural progression from liturgical Judaism) has known this for two millennia. It is the disciplines (and the liturgies) of the Church that bring us away from the cultural liturgical forces and toward the knowledge of God. And on this Easter Sunday, the culmination of the Great Fast, this great liturgy, will be here. We will celebrate the risen Christ. It is only in the liturgical framework that Easter begins to make sense as the most Holy Christian holiday. Christ is risen, Truly He is risen.